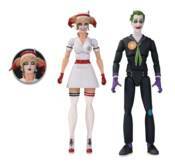 Based on the extremely popular DC COMICS BOMBSHELLS: THE JOKER AND HARLEY QUINN statue comes the most infamous crime couple in the DC Universe! This '40s style action figure 2-pack features exclusive DC BOMBSHELLS packaging and includes multiple accessories to perfectly re-enact any scene. DC DESIGNER SERIES BOMBSHELLS action figures are based on art from acclaimed artist Ant Lucia and have spawned from the immensely popular digital comics DC COMICS: BOMBSHELLS and BOMBSHELLS: UNITED.